In part one of this series, I discussed the three different types of body fat and in part two, I talked about the main part of fat loss, breaking the fat out of the cell. In this post, I will discuss in detail the two other mechanisms vital for fat loss as an acute variable and not over the long-term (which will be discussed in part 4). Brown Adipose Tissue (BAT) on the other hand is actually beneficial for fat loss as it contains mitochondria (where fat is used and hence “burned”) and is activated anytime you’re shivering to create heat. Visceral Fat is structurally a bit different than white adipose tissue and surrounds your internal organs like liver, etc. This fat is very unhealthy and releases pro-inflammatory signals which not only interfere with the functioning of the organ itself, but also becomes a self-perpetuating cycle in which the inflammatory signals create even more pro-inflammatory signals. 2 – The most important step in acute fat-burning is the need for the fat to actually be released from the cell. The best way for this to occur is to have low insulin levels, which can occur due to low carb intake or a strenuous workout. This in combination with the release of adrenaline (and nor-adrenaline) combine to send signals, in the form of Hormone Sensitive Lipase (HSL) which helps to release fat from the cell itself. Adrenaline is increased (in healthy conditions) under stress which in this case refers to a low calorie (or low-carb) intake and/or strenuous workout. The catch is that different parts of your body have been shown to have different adrenaline receptors. These receptors either help to break fat away from the cell or actually increase fat storage. Therefore, the same key has two opposite effects on fat loss. In simplified terms, Beta-adrenoreceptors are good for fat loss, whereas alpha-adrenoreceptors are bad for fat loss. Now once the triglyceride molecule (small molecule of fat) is broken apart from the larger fat cell, what it does after that determines the fate of your workout and eating habits. You see, if the fat is released through the stimulation of Beta-alpha receptors, (which happens during interval training), but then you stop exercising and sit down, the fat that was released from the fat cell typically will just end up back in the fat cell. This process is called re-esterification. The main thing that controls whether or not the fat is moved around the body is whether or not you continue exercising and the blood flow to a particular area of the body. For example, I said in part two that Alpha receptors are bad for fat loss. The double-whammy is that the more alpha-adrenoreceptors there are, the worst the blood flow. With poor blood flow, you have a higher risk of the free fatty acids, which were just released from the fat cell, going right back into the fat cell. On the other hand, if you actually do get the fat released from the cell and continue to exercise, your chance of it moving to another tissue to be used is much greater and your chances of actually “burning the fat” are increased. Once the free fatty acids are released into the fat blood stream, they are bound by a protein called albumin. So if you’ve broken the fat out of the cell, had the free fatty acid bound to albumin and moved around in the blood, if you’re exercising, then your body will need energy and since free fatty acids can be used for energy, your body will take the free fatty acid and import it into a working cell that can use it for energy (in this case, most likely muscle or liver). 1 – Fat burning and fat storage are usually happening simultaneously when you’re eating at maintenance calories. The balance between the two, or imbalance, will ensure whether or not you’re gaining or losing fat. 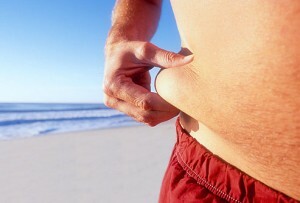 2 – High insulin levels make it hard to lose fat in the short-term. Those with uncontrolled insulin levels (pre-diabetic or insulin resistant) would be best served by lowering the carb intake and improving the quality of those carbs, with the lowering of the carb intake being more important for fat loss. 3 – The differences in Alpha (bad for fat loss) and Beta (good for fat loss) Adrenoreceptors make a huge difference in whether or not fat is stored or burned. These differences account for why it’s harder for fat loss to occur in different parts of the body. These differences not only tell the body to burn more fat or store more fat, but also influence blood flow to the areas involved. For example, thigh fat has been shown to have 9 times as much alpha-adrenoreceptors as other fat making it very hard to lose thigh fat. 4 – Going on a low-carb diet or fasting helps to inhibit alpha receptors. This means it makes it a bit easier to get to the stubborn body fat stores. 5 – Interval training is good at having the fat released from the fat cells (stimulating beta-adrenoreceptors) but is bad at using FFA’s as fuel. You use more glucose (carbs) for energy during interval training. 6 – The more aerobically fit you are, the easier it is for the free fatty acids (FFA) to get into the mitochondria and to be used as energy. Glycogen stores typically should be low also to get optimal fat burning. 7 – At the end of the day, there are a lot of steps involved with burning fat, but the same advice applies: Exercise, using both strength training and some form of cardio exercise, along with a lowered calorie diet for fat loss. As you continue to lose more and more fat, the harder it will be to continue to lose fat. At that point, the more advanced techniques can come in handy (special supplements, fasting, lower carb diets, strategic “re-feeds,” etc). Until then, focus on the basics and you’ll be best served. Stay tuned for Part 4 in this series which will talk about long-term fat loss and why it can be difficult and is harder for some people than others.